The HD81 has a two-piece design, including the projector itself and a separate video processor. The projector comes in a relatively compact, sleek, cream-colored case that will blend in well with a light-colored ceiling. An HDMI cable and a serial control cable connect the projector to the video processor, which is a slim black box that houses video processing circuitry and the projector's extensive inputs. The connection panel on the rear of the processor provides three HDMI inputs, two YPbPr component inputs, two BNC component inputs, two composite video ports, two s-video ports, two 12V triggers, one RS232C port, and an HDMI loop-through for an A/V receiver. On the flip-down front panel are one each of composite, s-video, and VGA. Practically speaking, no matter how many video source devices you have, you will be able to run signals from them directly into the projector rather than through an A/V receiver. The HD81's IR receiver is on the video processor rather than the projector itself, so remember to place the processor in such a way that you can still point the remote control at it from your preferred seat. The Optoma HD81 features a manual 1.2:1 zoom lens which will throw a 100" diagonal 16:9 image from 13.5' to 16.1'. There is no lens shift. Instead, there is a built-in fixed throw angle that places the top edge of the projected image about 35% of the image height below the centerline of the lens when ceiling mounted. This translates to a 17" drop on a 100" diagonal image. Most users will want to install the HD81 on the ceiling behind the seating area, as it requires at least 13.5' of throw distance to produce a 100" diagonal image. If the desired viewing distance is 1.5x the screen width, then for a 100" screen the seats will be 10.8' from the screen, and the projector several feet further back. The built-in throw angle will allow for the placement of the projector on a coffee table, but that will require the viewer to sit at a distance of at least 2.0x the screen width, which is farther back than many people want to sit. In addition, louder than normal fan noise could be distracting during quiet interludes in a film's sound track if the unit is placed directly in front of the viewers. Rear shelf mounts are nearly unworkable with the HD81 due to the built-in throw angle. If installed upright it would require tilting the projector and use of keystone correction which introduces a touch of softness to the high definition image. This should be avoided if one wishes to take full advantage of the projector's high-definition capabilities. In theory one could invert the projector and attach it to the underside of a high rear shelf with a ceiling mount kit, but this could inhibit heat dissipation and is not recommended. Three cables run to the projector itself - the HDMI and serial cables from the video processor, and a power cable. All signal sources and other home theater components connect directly to the video processor, which can be rack mounted with your other equipment. 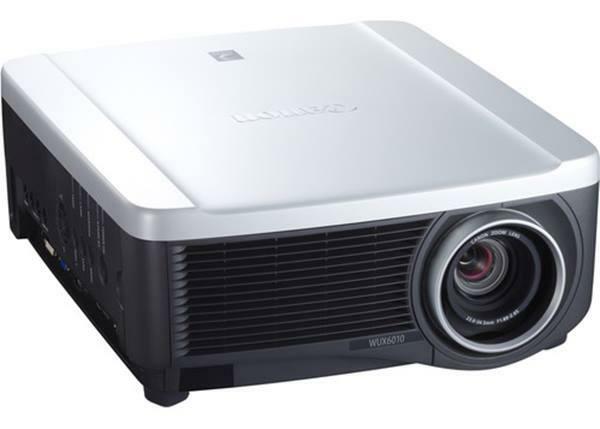 The projector has a variable iris which can be operated manually or automatically. The automatic setting is nearly useless, as updating is painfully slow and the iris motor is clearly audible. However, using a manual iris setting to increase contrast is perfectly workable. The iris can be closed incrementally via the menu from settings 1 to 16, where 16 is minumum aperture. The iris control allows the user to select the right trade-off between lumen output and black level for the given screen size and room environment. The published lamp life spec is 2000 hours. The price of the replacement lamp is currently $385, which is typical for this class of product. Note also that this is a 300-watt lamp, which is brighter and hotter than the lamps used in most other home theater projectors. The advantage is the bright image that it delivers. But it will also throw off more heat than competing products with lower wattage lamps. Thus it is more capable of warming up a small room that is not adequately ventilated or air conditioned. This needs to be considered as part of the planning for the installation. Another bit of good news is that the HD81 has no air filter to clean or replace, so the only routine maintenance required on the projector is lamp replacement. When the projector is mounted on the ceiling, this means less time spent on a ladder and more time spent watching your favorite films.